From shy smiles to stunning jewels, from cheery bridesmaids to candid emotions, we’ve rounded up some of our favourite bridal photos to inspire all our brides-to-be. Bridal portraits are the soul of a wedding album as they show a bride – resplendent in her wedding finery and animated with emotions - before actually tying the knot. These portraits, shot creatively in different locations, can be displayed at receptions, framed and given as gifts to loved ones, or simply treasured by the couple as a beautiful memory. Some of our favorite photographers have captured stunning must-have bridal portraits over the years that we just had to share… From shy smiles to stunning jewels, from cheery bridesmaids to candid emotions, we’ve rounded up some of our favourite bridal photos to inspire all our brides-to-be. ‘Behind the scenes’ portraits of a bride getting ready are some of the most memorable shots as they capture her excitement in an unrehearsed way. This is a great way to capture spontaneous emotions - like a mother holding back tears while draping her daughter’s head with a veil, or a gang of jolly bridesmaids laughing at an old joke. Candid close-ups of the make-up, hair and draping process adds an evocative edge to the wedding album where a majority of the photos are bound to be picture-perfect and rehearsed. A photographer can never predict what emotion he may capture during these ‘behind-the-scene’ shoots and that’s the beauty of it. A perfect bridal portrait calls for stunning jewellery as it adds compelling complexity to a bridal portrait where the face is the highlight. Skilled photographers will use clever lighting to accentuate the pretty pearls in your maang tikka or capture the reflective glow of that exquisite gold and diamond bling on your skin. Every expression of the bride is captured up, close and personal so no details are left out, be it her wistful gaze while waiting for the baraat or that winning smile as she spies her intricate mehndi. The camera is a witness to her innermost emotions as they get reflected on her face in these candid close-ups. The wedding lehenga nowadays is a true couture masterpiece that deserves its own pride of place in the bridal portrait collection. 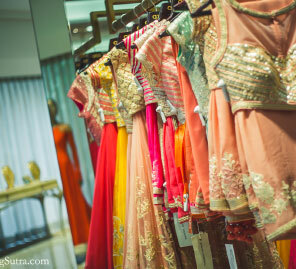 Photographers and stylist are using ornate, colourful lehengas as the focal point in interesting ‘prop-like’ ways. From close-ups pictures of the embroidery details to the hint of a face peeking beneath the veil, every part of a wedding lehenga lends itself to stylish images. As it is probably one of the most expensive and carefully chosen ensembles in a bride’s trousseau, it’s little wonder that a wedding lehenga has become a showstopper for many bridal portraits. Add a beloved family pet like a dog to a bridal portrait shoot, and immediately the stress is gone! Unrehearsed and unguarded, pets help bring that same joyous, carefree vibe to photos. And since pets are so much a part of the family for many brides, it is great to include them in photoshoots – the fun memories will evoke smiles for years to come. 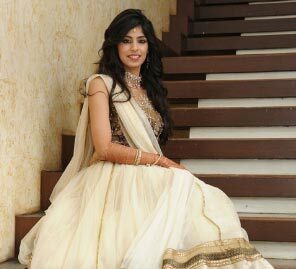 Bridal portraits are incomplete without her heels in the limelight. Sleek sky-high stilettoes add drama to bridal portraits when captured in an interesting way. Close-ups of mehndi designs – which are nothing less than an intricate art form – are essential in a wedding album. Apart from the beauty of the designs, these portraits invariably capture a happy bride, radiant and relaxed with her gang as she is the centre of attraction during this fun, traditional ceremony. Her limbs are the beautiful canvas for the patterns, which the wedding album files away as memories – that, unlike henna, never fade. What’s a bridal portrait session without best friends around? Brides should brainstorm with their photographers about the best ways to incorporate the girlie gang into shoots. With their matching bridesmaids clothes, but unique personalities, every friend will add a different vibe to the group photos – and the memories will be treasured by all for years to come. Reflections in a mirror have always meant arresting compositions, be it in photos or films. 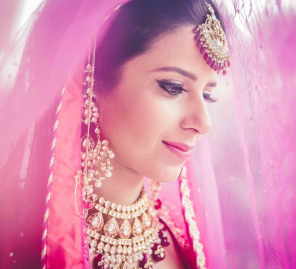 A fully decked-up bride with a perfect face and a regal ensemble staring back at herself in a mirror provides ample creative space to capture mesmering shots. One of the most emotionally intense moments for any bride is when she heads down the aisle or makes a grand entry towards the mandap. There is an air of festive finality to this most photographed moment that everyone has been waiting for… when a couple finally seal the deal to start their new innings as husband and wife. Photos taken at this time elevate the whole significance of the occasion as they capture this final rite of matrimony.